Young Voices of Colorado provides opportunities for Vocal Music Outreach to area elementary school singers and teachers. These projects give singers an opportunity to sing with other children who LOVE to SING! Elementary and middle school music teachers are invited to observe Young Voices rehearsals at any time. Directors Jena Dickey and Margie Camp are available to travel to area elementary and middle schools to serve as guest clinicians or as observers who can offer feedback to the choir and teacher. 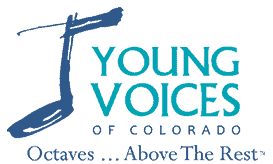 Young Voices of Colorado offers several special outreach programs for area elementary and middle school singers throughout the year. Music teachers who would like more information on any of these outstanding programs, should submit the form at the bottom of this page. On two days in April, our Young Voices choirs travel to area schools in Arapahoe and Douglas Counties to demonstrate the opportunities available in choral singing. In 25-minute school assemblies, our choirs entertain and inspire their audiences, while our teacher/conductors engage the school populations in singing rounds with the choir. We conclude each concert by congratulating the school’s choir members and encouraging other students to participate in their school music programs. To invite us to your school, please call us at 303-797-SING (-7464). We do not charge for this opportunity! Friday, April 5, 2018 – Choristers and Brio on tour! Friday, April 12, 2018 – TrebleMakers and Concert Choir on tour! This popular, intensive weekend choral experience project serves 4th – 6th graders who love singing and who are recommended by their school music teachers. Approximately 100 elementary school singers come together on a Friday to learn and rehearse together in preparation for an evening performance. The choral experience involves children who have developed a passion for singing in their school music programs and honors those who have become leaders in their school choirs. The extra challenge they experience often inspires them to return to their home schools and encourage their peers toward choral singing excellence. PrairieVoices is held in East Adams County, but is open to elementary schools from all counties. This popular, intensive weekend choral experience project serves 4th – 8th graders who love singing and who are recommended by their school music teachers and are a Westminster High School feeder school. Approximately 100 elementary school singers come together on a Saturday to learn and rehearse together in preparation for an evening performance. The choral experience involves children who have developed a passion for singing in their school music programs and honors those who have become leaders in their school choirs. The extra challenge they experience often inspires them to return to their home schools and encourage their peers toward choral singing excellence.